There are, it is thought, around 4,000 tigers still living in the “wild”. There may be as many as 8 – 9,000 in captivity (3,000 in China and perhaps 5,000 in the US). The tigers in captivity are in zoos and parks and are, in the US, often bred for “hunting”. Very few (< 100 perhaps) of those in captivity are returned to the “wild” every year. Breeding hybrid tigons and ligers once used to be very popular in zoos but less so now though it is still prevalent for entertainment purposes. The numbers are not very significant. Yet they are more than just a magnificent animal – they are also crucial for the ecosystems in which they live. As top predators of the food chain, tigers keep populations of prey species in check, which in turn maintains the balance between herbivores and the vegetation upon which they feed. Balanced ecosystems are not only important for wildlife, but for people too – both locally, nationally and globally. People rely on forests, whether it is directly for their livelihoods or indirectly for food and products used in our daily lives. ……… Tigers not only protect the forest by maintaining ecological integrity, but also by bringing the highest levels of protection and investment to an area. Tigers are an “umbrella species” – meaning their conservation also conserves many other species in the same area. They are long-ranging and require vast amounts of habitat to survive; an adult male’s home range varies from 150 km2 – 1000 km2. Tigers are endangered because their habitats are disappearing. That habitat loss is fundamentally irreversible. As a species they already have no significant role to play in the ecosystem prevailing. They have already become a redundant species biologically even if the concept of majestic tigers roaming wild forests still has a massive emotional impact on the selfish human psyche. Creating new tiger reserves – constrained in area by various means – is little more than creating glorified zoos. They are just parks where the cages are a little bigger. The tigers themselves are “frozen” into their current, unsuccessful, unsuitable, failed genetic state. They are doomed to continue unchanged and unchanging in a shrinking and ever more unsuitable habitat. There are no natural selection pressures (or artificial selection measures) in play which would make their descendants more capable of surviving in the new habitats due to changes that have already happened and have yet to come. This “conservation” is not about helping the tiger to survive by evolving but is only about freezing them into an increasingly untenable form. It is backwards looking and all about preserving failure. I am even more convinced that traditional “conservation” is misguided and is done just to satisfy the emotional needs of humans, and not, in any way, forward-looking to help endangered species to adapt and survive into the future. …. All those species which succeed into the future will be those which continue to “evolve” and have the characteristics necessary to thrive within the world as it is being shaped and changed by the most successful species that ever lived (though we cannot be sure how far some particular species of dinosaur may have advanced). Putting a tiger into a zoo or a “protected” environment actually only preserves the tiger in an “unsuccessful” form in an artificial environment. Does this really count as “saving the species”? We might be of more use to the future of the tiger species if we intentionally bred them to find a new space in a changed world – perhaps as urban tigers which can co-exist with man. I’ll still make a donation to Project Tiger but that is about helping individuals to survive and has nothing to do with saving the species. 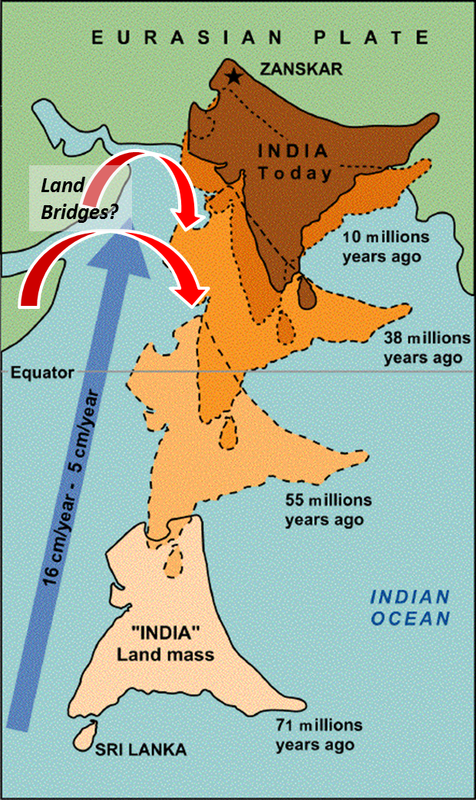 About 200 million years ago the land mass that is now the India plate was part of Gondwanaland. When this plate broke off from Gondwana around 135 million years ago it included what is now Madagascar but then left Madagascar behind as it began – by tectonic standards – a headlong rush north-eastwards around 90 million years ago. Till the collision of this plate with Asia around 10 million years ago brought about the formation of the Himalayas. For around 80 million years then the Indian land mass was an isolated island “rushing” north-east at between 16-20 cm/year! This period was also extraordinarily rich in the evolutionary history of the mammals. It was the time when snakes and ants first appeared. There was a mass extinction event about 66 million years ago. The dinosaurs disappeared and became birds. Birds proliferated and so did large flightless birds. The diversity of mammals exploded, perhaps just because of the space left by the disappearance of the large, unsuccessful dinosaurs. The first pigs and deer developed. The grasses arrived. Carnivorous mammals appeared as their prey increased. The first primates made an entrance. But whatever was evolving on the Indian land-mass was evolving largely in isolation from that taking place in the areas that were to become Africa and Eurasia. But there are tantalising indications that on its journey the Indian land-mass may have been connected for short periods by a land bridge to the Horn of Africa or to what is now Arabia. A new paper reports on fossils from the edges of an open cast coal mine north east of Mumbai in Western India. The results suggest that an ancient relative of horses and rhinos lived 54.5 million years ago in what is now India. The findings shed light on the evolution of this group of animals. Several groups of mammals that appear at the beginning of the Eocene, including primates and odd- and even-toed ungulates, might have evolved in India while it was isolated. John Hopkins Press Release: Working at the edge of a coal mine in India, a team of Johns Hopkins researchers and colleagues have filled in a major gap in science’s understanding of the evolution of a group of animals that includes horses and rhinos. That group likely originated on the subcontinent when it was still an island headed swiftly for collision with Asia, the researchers report Nov. 20 in the online journal Nature Communications. Modern horses, rhinos and tapirs belong to a biological group, or order, called Perissodactyla. Also known as “odd-toed ungulates,” animals in the order have, as their name implies, an uneven number of toes on their hind feet and a distinctive digestive system. Though paleontologists had found remains of Perissodactyla from as far back as the beginnings of the Eocene epoch, about 56 million years ago, their earlier evolution remained a mystery, says Ken Rose, Ph.D., a professor of functional anatomy and evolution at the Johns Hopkins University School of Medicine. And something to get away from the infinite cruelty, ugliness and stupidity that is ISIS and the Wahhabi tradition. 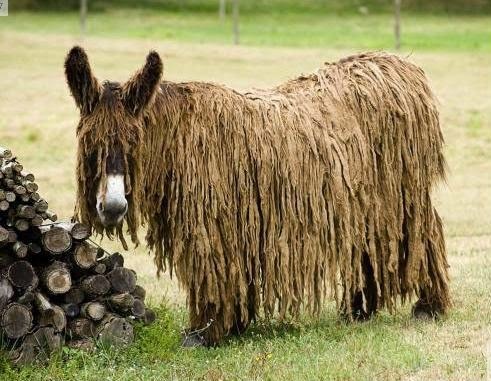 The Poitou donkey from South West France. In the last 30 years their numbers have increased from about 30 to over 500. The cows are “going to the mattresses”! Instead of the usual hard rubber mat, some lucky Swedish cows will now enjoy a two inch thick mattress with a protective layer of Goretex developed especially to give them a more comfortable life. Custom designed mattresses to get the cows to give more milk and live longer. That is the expectation of the Natural resource program at the Nils Holgersson Gymnasium, Skurup. “Research has shown that the milk is produced when the cow is lying down” says Göran Thorsson, barn foreman at the Gymnasium. “It is when she is resting and ruminating that production starts and a cow needs to be lying down for twelve hours a day to feel really good”. Most of his cows are lying down, and some seem to be really enjoying themselves with outstretched legs but at first they were greatly skeptical explains Göran Thorsson. “At first they did not dare to lie down. They just stood and stared for several hours and we were really worried that we had made ​​the wrong bet, but then they stepped gently up and once they settled we could hardly get them up gain”, he laughs. In an adjacent box lie cows soon after giving birth in a thick layer of straw but using straw with many cows is difficult to keep clean, and too heavy for the cleaners. The purpose of the specially designed mattresses is not only milk production but also to give the cows a longer life. On hard surfaces they often injure their legs which leads to infections. Additionally, hard surfaces stress the cows’ joints and the reduced stress is intended to extend their life. “A dairy cow lives five years on average and we of course hope that the mattresses keep them healthier and for longer”. After just a few weeks with the new mattress it seems that both cows and their carers are satisfied, but there is a problem. “We have a tough job to get them up in the morning” he says, smiling a wide smile. “When we normally arrived at 5 am the cows were all up, but now they are all still lying down and can be hard to rouse”. But far from being anything unusual this is an annual event. These claims of melting ice and unprecedented walrus behaviour are regurgitated by the Global Warming media year after year and by the ever less credible WWF. As zoologist Dr Susan Crockford points out, such stampedes are nothing new and are not due to low ice cover and the alarmist hype is blatant nonsense. At least two documented incidents like this have occurred in the recent past: one in 1978, on St. Lawrence Island and the associated Punuk Islands and the other in 1972, on Wrangell Island (Fay and Kelly 1980, excerpts below). …….. The Walrus Islands — State Game Sanctuary was founded in 1960 and walrus numbers are up sharply since that time. Best known among the WISGS islands is Round Island, where each summer large numbers of male walruses haul out on exposed, rocky beaches. Round Island is one of four major terrestrial haulouts in Alaska; the others are Capes Peirce (Togiak NWR), Newenham (Togiak NWR), and Seniavin (near Port Moller). Male walrus return to these haulouts every spring as the ice pack recedes northward, remaining in Bristol Bay to feed they haul out at these beach sites for several days between each feeding foray. The number of walrus using the island fluctuates significantly from year to year. However, up to 14,000 walrus have been counted on Round Island in a single day. That environmental alarmists try and hype this annual event is understandable since they need to justify and reaffirm their religious beliefs. That the mainstream media are gullible enough to regurgitate this nonsense year after year is more disappointing. The manner in which humans came to invent gestures and sounds, then developed these into words, then into language and eventually on into writing is a critical and fascinating story from our past that will probably never be fully known or understood. No doubt for humans there is also a connection to the invention of counting, the use of abstract symbols and the evolution of numeracy and the beginnings of the languages of mathematics.The timeline of these evolutions are also in much doubt. Possibly gestures and sounds go back 300,000 years (or even further), but language was established among humans only by about 50,000 years ago. Words and their earlier sounds must have come much, much earlier and writing very much later. Cave paintings around 30,000 years ago may represent the period when abstract symbolism was taking off. It is thought that writing did not come until agriculture expanded – perhaps from about 12,000 years ago. Now research on animal sounds suggests that for some species the sounds they make are not as random as they were originally thought to be. They exhibit levels of complexity which are suggestive of stepping-stones along the long road to grammar and language. Such steps may have assisted humans from moving from sounds and words to context-free grammars and thence to language. The study, published today in the journal Proceedings of the Royal Society B, analyzed the vocal sequences of seven different species of birds and mammals and found that the vocal sequences produced by the animals appear to be generated by complex statistical processes, more akin to human language. …. Many species of animals produce complex vocalizations – consider the mockingbird, for example, which can mimic over 100 distinct song types of different species, or the rock hyrax, whose long string of wails, chucks and snorts signify male territory. But while the vocalizations suggest language-like characteristics, scientists have found it difficult to define and identify the complexity. Typically, scientists have assumed that the sequence of animal calls is generated by a simple random process, called a “Markov process.” Using the Markov process to examine animal vocalization means that the sequence of variables—in this case, the vocal elements—is dependent only on a finite number of preceding vocal elements, making the process fairly random and far different from the complexity inherent in human language. ……. “Language is the biggest difference that separates humans from animals evolutionarily, but multiple studies are finding more and more stepping stones that seem to bridge this gap. Uncovering the process underlying vocal sequence generation in animals may be critical to our understanding of the origin of language,” said lead author Arik Kershenbaum, a postdoctoral fellow at the National Institute for Mathematical and Biological Synthesis. Many animals produce vocal sequences that appear complex. Most researchers assume that these sequences are well characterized as Markov chains (i.e. that the probability of a particular vocal element can be calculated from the history of only a finite number of preceding elements). However, this assumption has never been explicitly tested. Furthermore, it is unclear how language could evolve in a single step from a Markovian origin, as is frequently assumed, as no intermediate forms have been found between animal communication and human language. Here, we assess whether animal taxa produce vocal sequences that are better described by Markov chains, or by non-Markovian dynamics such as the ‘renewal process’ (RP), characterized by a strong tendency to repeat elements. We examined vocal sequences of seven taxa: Bengalese finches Lonchura striata domestica, Carolina chickadees Poecile carolinensis, free-tailed bats Tadarida brasiliensis, rock hyraxes Procavia capensis, pilot whales Globicephala macrorhynchus, killer whales Orcinus orca and orangutans Pongo spp. The vocal systems of most of these species are more consistent with a non-Markovian RP than with the Markovian models traditionally assumed. Our data suggest that non-Markovian vocal sequences may be more common than Markov sequences, which must be taken into account when evaluating alternative hypotheses for the evolution of signalling complexity, and perhaps human language origins. The inconsistencies in the “conservation” movement and the meaningless defence of “biodiversity” have never been so apparent as in this case where the UK is wiping out all the females of a duck species just because the males are too successful. Once again an inadequate and failing species is being “protected” by exterminating a successful one for no other reason than that it is successful. The nonsense spouted in the name of “conservationism” is amusing but always expensive and without any real benefit. It is American, oversexed and over here, but the days of the ruddy duck in the UK are finally numbered, with the latest culling data revealing that just 10 females remain. The shooting of the final few – at about £3,000 a bird – will mark the end of half a century of occupation by the species. At their peak, their numbers reached 6,500 but their breeding prowess threatened the native European white-headed duck. The UK ruddy ducks also spread their wings across Europe, into France, Belgium, the Netherlands and into Spain. The discovery of hybrids in the latter country in the 1990s showed the ducks had grown into a continent-wide threat and that sealed their fate. The following year, an eradication programme began in the UK and a marksmen who has been part of the cull since then told the Guardian the birds fulfil the idea of a sitting duck. Clearly gender equality is not something for ducks when the females are culled for the “sins” of the males. If ruddy duck males are preferred by the female white-headed ducks (and they have no problem in breeding together) why are these “conservationists” not allowing natural selection to take its course? If male conservationists were preferred by normal females then perhaps the solution is to eradicate all female conservationists? Sixty five million years ago, the theory goes, a 6 mile long asteroid slammed into the earth and caused the extinction of all non-avian dinosaurs as part of a mass extinction event. Some 50% of all species living at the time – the hypothesis proclaims – vanished in this mass extinction event. It’s the stuff of catastrophe theories and movie scripts. Smithsonian: Sixty-five million years ago the dinosaurs died out along with more than 50% of other life forms on the planet. This mass extinction is so dramatic that for many years it was used to mark the boundary between the Cretaceous Period, when the last dinosaurs lived, and the Tertiary Period, when no dinosaurs remained. This is called the Cretaceous/Tertiary (or K/T) boundary, and the associated extinction is often termed the K/T extinction event. ……. Most theories focused on climate change, perhaps brought on by volcanism, lowering sea level, and shifting continents. But hundreds of other theories were developed, some reasonable but others rather far-fetched (including decimation by visiting aliens, widespread dinosaur “wars”, and “paläoweltschmertz”­the idea that dinosaurs just got tired and went extinct). It was often popularly thought that the evolving mammals simply ate enough of the dinosaurs’ eggs to drive them to extinction. But a new paper now suggests that dinosaurs actually shrank as they evolved over 50 million years to become the birds we know today. This still means that it was the dinosaurs vacating space on land which gave rise to the growth of mammal species, but it was not a one-time catastrophic event. No mass extinction then! No fireworks apparently. Just a gradual, fairly mundane process where the large and cumbersome were deselected as they ran out of the ability to feed themselves and died off. While the small and the nimble both needed less food and were more capable of getting it. University of Southampton Press Release: A new study involving scientists from the University of Southampton has revealed how massive, meat-eating, ground-dwelling dinosaurs evolved into agile flying birds: they just kept shrinking and shrinking, for over 50 million years. Today, in the journal Science, the researchers present a detailed family tree of dinosaurs and their bird descendants, which maps out this unlikely transformation. They showed that the branch of theropod dinosaurs, which gave rise to modern birds, were the only dinosaurs that kept getting inexorably smaller. “These bird ancestors also evolved new adaptations, such as feathers, wishbones and wings, four times faster than other dinosaurs,” says co-author Darren Naish, Vertebrate Palaeontologist at the University of Southampton. The study examined over 1,500 anatomical traits of dinosaurs to reconstruct their family tree. The researchers used sophisticated mathematical modelling to trace evolving adaptions and changing body size over time and across dinosaur branches. The study concluded that the branch of dinosaurs leading to birds was more evolutionary innovative than other dinosaur lineages. “Birds out-shrank and out-evolved their dinosaurian ancestors, surviving where their larger, less evolvable relatives could not,” says Associate Professor Lee. Conservationists would have us believe that the earth is losing species at an alarming rate and that evil humanity is to blame and therefore more and more species must be protected by “freezing” them into an unnatural existence. Alarmist “conservationism” has led to the ridiculous situation where successful species are termed pests and are eradicated. Hopelessly unfit species – if they are cuddly or otherwise attractive to watch – are protected by being sentenced to a “frozen” existence in zoos or in “protected” and totally unnatural and anachronistic habitats. I was just watching a program about the highly successful urban coyotes of N. America. 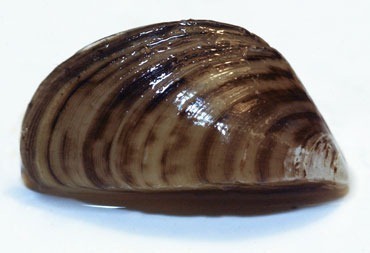 They have found a new prey in domestic pets and are thriving. But having adapted successfully to the changing environment they have – needless to say – earned the status of being declared a pest to be wiped out!! And yet there have never been more species alive than there are today. The planet’s current biodiversity, the product of 3.5 billion years of evolutionary trial and error, is the highest in the history of life. But it may be reaching a tipping point. In a new review of scientific literature and analysis of data published in Science, an international team of scientists cautions that the loss and decline of animals is contributing to what appears to be the early days of the planet’s sixth mass biological extinction event. If biodiversity “is the highest in the history of life” and many species are incapable of adapting to the world they live in, perhaps it is time for them to exit gracefully. Perhaps the progress of humankind requires that some of these obsolete species must be allowed to disappear. The dangers of reducing biodiversity are being hyped to a ridiculous extent. Without the mass extinctions of the past, most of the species living today would never have evolved. If the dinosaurs had not gone extinct we would not be around. And the disappearance of the dodo has not increased any threat to humanity.